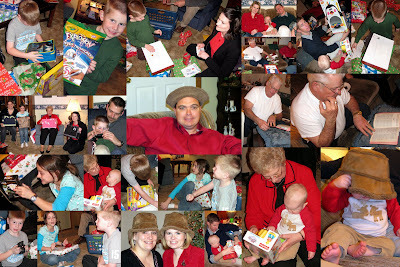 What Makes a Great Christmas? It was such a nice day today the boys and I went out to play before dinner. After some baseball, I wanted to take some pictures of my silly boys. I've been wanting to get pictures showing their cute freckles and today it worked. I wished Aiden would have been awake to join us but who knows how well he would have worked with us. As we were driving home from Jim's tonight Xavier was talking about his Book Buddy at school. I asked him if he was in 6th grade. He thought maybe he was in 7th grade. Damon starts laughing, "7th grade? If he was in 7th grade he would be in college!" The we got to talking about the boys going on missions and going off to college and never coming home. Sad! For Christmas, my parents gave all of us a night in KC plus some spending money. We got to KC late Saturday afternoon. Hung out a bit with my family and then went to dinner at TGIF. I have only gone to TGIF a couple of times but this place was horrible. Slow service, food just ok, dumb waitress. After though we went to ride the carriages around the Plaza. I had done it years ago on a double date with my sister but I think we were the only ones to have done it before. We were able to get a big carriage for the whole family. It was really cold but we survived. That night we all met up in my parents room for snacks and family gossip. Saturday we went to Union Station and took the boys to the science place. It was fun running around there and seeing all the cool things they had for the kids. I have very few pictures of Xavier because he was spending all of his time with his Uncle Brenden his most favorite person in all the world. I think he would pack his bags and move if we would let him. An infomercial for BowFlex came on while the boys were watching tv. Damon, "That's just for moms and dads." Xavier, "No, I can do it too. I want chest muscles." Damon, "You don't want chest muscles. Then if you take off your shirt girls will kiss you." UPDATE: Aiden had his DR appointment and he now weighs 20lb 11 oz, he is 29 1/2in long, and his head is 17 3/4in around. According to the charts he is 75-90 percentile in length, and 25-50 percentile for weight and head circumference. 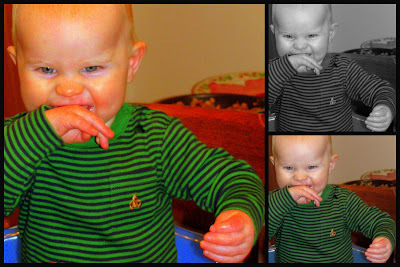 Aiden is now 9 months old. He was a lot of fun during our Christmas festivities. He could grab the paper and unwrap farely well (with a little bit of help). He has enjoyed playing with his toys he got. He loves to feed himself. In fact it is getting nearly impossible to feed him baby food because he throws a fit. Whenever he wants more food he starts banging his tray...but in a cute way. He loves crackers, especially graham crackers. If he sees you go to the cabinet where we keep the crackers he starts making a lot of noise and banging his hand down. He also loves LOVES blueberry muffins from Early Edition. Whenever we go he starts freaking out as soon as he sees the blueberry muffin. He also never drops a piece of it, unlike the other things he eats. He is starting to talk quite a bit, says dadada and bababa and other cute little sounds. He totally lights up and starts crawling to the door when Adam comes home from work (which Adam loves). "Santa Claus knows what you need and what you don't"
Damon and Xavier both got these squishy balls and Damon asked, "What can you do with it." Xavier's answer, "You can fart on it." 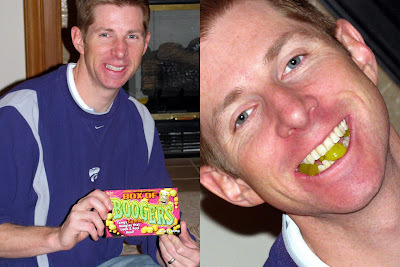 "I'm not gonna eat my boogers anymore." when Adam was eating his candy boogers and they looked gross. Adam got a present from his parents wrapped with duct tape with "What is this?" written on the box. As we are talking about this, Xavier says, "That must be from Jim only Jim has duct tape." 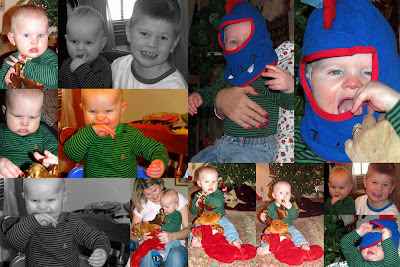 Aiden's stocking had a reindeer on it that sang, lit up, and clapped its antlers. He loved it! He was a little camera shy though. Every year Jim gives everyone bags for Christmas. My sisters have gotten one in years past but this was Jordan's and Lois's first time. My sisters are such goof balls over the bags, I had to document it for Jim's amuzement...and for everyone elses as well. For me...5 new pairs of shoes. How awesome is that!?! The boys got up Christmas morning and unloaded their stockings (Santa didn't bring much this year in the stocking department). But anyway they liked everything that they got. Damon got 2 new long sleeve t-shirts, a new comforter, and an Erector set (Which is quickly becoming my erector set because it is so stinking hard to put together!) Damon really wanted this Erector set but it was kinda pricey. I told him he would only get it and nothing else. 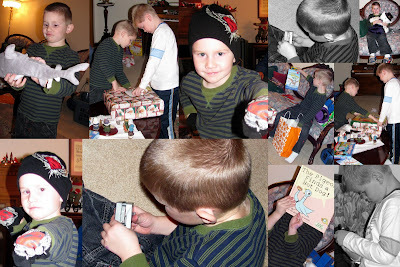 So he was totally tricked when he got it and 2 other presents. He kept saying, "Momma you tricked me, you got me good momma." Xavier got 2 new long sleeve t-shirts, a new comforter, and a bunch of Thomas the Train stuff. He has never had a set for his smaller magnet trains so we got him fixed up. When he opened it he said, "Momma you listened to me, you got me everything I wanted." Aiden got a new outfit and a giraffe ball toy thing. I wanted to paint him a picture for his room but that never happened...sorry A! 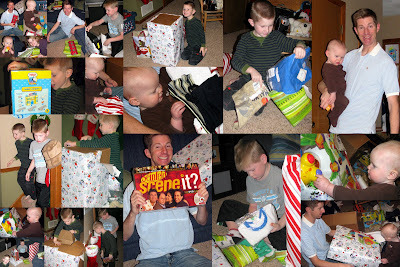 The boys also got new clothes from Jim and Jan.
Adam got some new tools and Seinfeld Scene It. I got Snow boots and some really awesome heels! We always spend Christmas Eve with my family. For lunch Adam, me and the boys went to my favorite Chinese place. It really is the best chinese I've ever had. So we try to go as much as we can, it is just soooo darn good. I wish they would open one in Manhattan. I know the last thing we need is another Chinese place, but we could use a good one! That night we always go to the First Baptist Church (the church I grew up in adn the one my parents still go to) Christmas Eve Service. After my sisters and I deliver plates of goodies to my 3 uncles and to her Branch President's house. We went a tad bit overboard this year (when I say a tad, I mean we could have given the entire Army cavities with the amount of food we had). Then we had dinner with our family, yummy soups from Panera! Next my dad reads about the birth of Christ from Luke 2, we sing some carols, and then we open presents. Charla got Carrie and I the same hat and shoes (Charla also owns the same too) so that we can all be Zingers (I think they are the only things that come in a pack of three?). Someone made an observation about us. She noticed that while we sisters as so similar, we're also very different. "That must be such a blessing." she said. I laughed at first, "IT only works because we are sisters, it wouldn't work between simple friends." Her statement got me thinking. Yes, our differences are a blessing. The very thing that usually dives us crazy, but it seems to be true. The strength of one sister seems to always meed the needs of another sister. We understand our unique sense of humor, because we're sisters. We balance each other's personalities, because we're sisters. We can laugh with each otehr and cry on each other, because we're sisters. We have ups, downs, swinging moods and still see the best in each other, because we're sisters. We tick each other off and get on each other's nerves, because we're sisters. We turn to each other for advice, comfort or a listening ear, because we're sisters. We can count on each other and back each other up, because we're sisters. 20 minutes or 2000 miles away we're close in spirit and in heart, because we're sisters. But, best friends wouldn't have made it because of the differences. We're stronger than best friends. 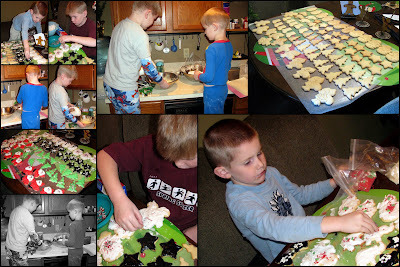 The boys and I made sugar cookies on Christmas Eve Eve. They are my uncles favorite so I thought I would make them for our goodie plates my sisters and I always take over Christmas Eve night. The boys were all excited to decorate, but the excitement wore off in about 15-20 minutes. Which left me with a lot to do by myself. 79 cookies later...we were done. While I was busy, the boys were playing so nicely and it was pretty amusing. I recorded them without their knowledge. Don't mind the laundry in the shot, it is clean at least. 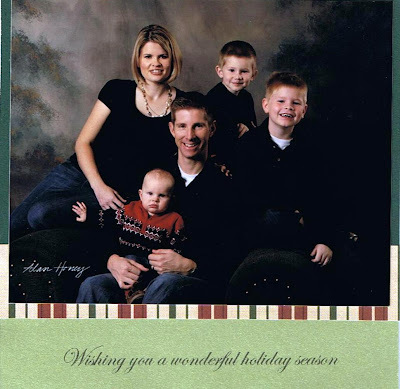 So I foundout that our Christmas cards are costing people 20 cents. Sorry about that...I'll fire my assistant. Some of them have returned to us, so if we see you soon I will hand deliver it (hows that for service huh?) However if you don't want to spend the 20 cents, this is what you will be missing...we're cute enough to get 20 pennies out of you...right? I do have to wonder about the postal service...wouldn't it be cheaper to just give the envelope to the person than to send it to you then back to me over 20 cents? Does that make sense? Damon's birthday is turning into mine! It has lasted the whole week! 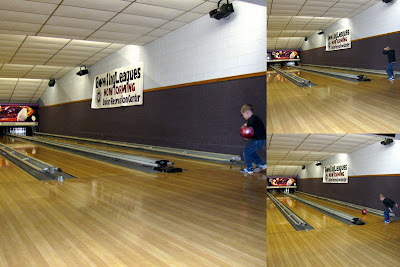 Saturday we took Damon, Xavier, and 3 classmates bowling at the Union. It happened to be one of the coldest days that we have had. The wind was horrible but that really has nothing to do with anything. Anyway, the funniest thing was some of things the kids said. The first being Xavier telling Andrew, "My dad is the greatest bowler ever in the whole world." Andrew says, "No, he's not." Adam then bowls and gets 9 pins. "See, I told you he was the best." Andew says to Adam later in the game, "You have long arms when you bowl. And your skinny, how can you be so strong." This is Xavier bowling...he had an interesting style but he did win. For Damon's actual birthday on Thursday, I took cupcakes to his class. They are Batman. In hindsight, I should have made cookies and cut them to the right shape. Which by the way we will probably be having for Christmas since I still have a ton of black and peach icing. I guess we could have black christmas trees with peach decorations? After school, I took Damon to Target with his $7 from Great Grandma to buy a new toy. For dinner we let Damon decide on what to have. He picked Biscuits and Gravy so I made that for all of us, plus milk shakes. That evening we got to talk to Ben and Kelly through Skype. 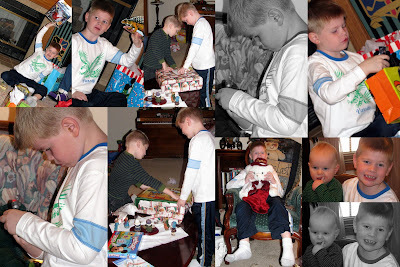 They had sent the boys presents early so I saved them so they could see them unwrap. FYI good pick on the toys, they begged to put them together that night and haven't been put down since. It snowed today...a lot. The boys could not wait until after piano practice to go outside. Then he decided that the first snowman needed a friend. We celebrated Damon's birthday on Saturday evening. His actually birthday is the 18th but it just worked out to do it this weekend. We ordered some soup from Panera and had a little dinner for everyone before hand. Then Damon dived into his presents and got a lot of great stuff. We were happy that most of our friends and family were able to come. And Damon was very happy that they all brought gifts! Xavier is slightly obsessed with his Uncle Brenden so every picture is of him crawling all over him. Tonight was the Ward Christmas Party. We went a little late...I'm not a pork eater and they were having ham for dinner, Adam picked up Subway on his way home...and it was packed! As we were watching the program, Xavier's friend Rachel came over to sit with us. I thought they looked so cute sharing a chair we had to get a picture. Damon was WAY excited for Santa. I had convinced him earlier this month that the real Santa comes to the church party. So he was prepared to talk to the man. Xavier however would not go near him but at least he wasn't screaming and crying like some of the other kids. Aiden keeps crawling over to the piano to play a couple keys. Who is smarter: I dont know...he could stick it out through college so I'm saying him. Although I didn't quit because I was dumb, I just hated k-state...no offense. Who does the laundry: Are you kidding me? 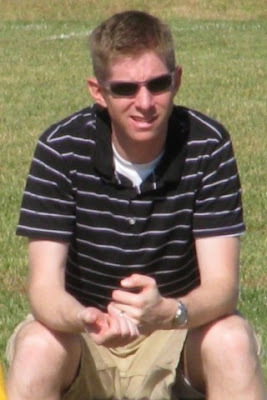 Who mows the lawn: Adam, I don't know how to start the lawn mower. Who drives: It depends on who drove last. But if we are going to Aggieville Adam drives. I can't parellel park. And he drives whenever we go out of town. Who kissed who first: Adam, he needed some lip balm and I had just reapplied. Who wears the pants: Can we share pants? I think we are pretty much on the same page. Damon was dragging this dinosaur around and Aiden was just chasing after him the whole time. It was pretty cute. It would have been a good time to pull out the video but I didn't think about that until after.